With 'a delicious sense of irony that would make even Nigella Lawson blush' managing editor David Donovan tells the story of former LNP politician Gavin King, one of Queensland’s most 'ironic' people. IT OFTEN SEEMS as if it is a prerequisite in conservative politics to possess a strong case of hypocrisy. I mean, it is the sort of thinking that makes a bigoted prime minister select himself as minister for women. It is sort of thinking that defends the racist persecution of innocent asylum seekers by locking them up in concentration camps as somehow a way of stopping them from drowning at sea. The sort of thinking that attacks new mothers claiming childcare benefits from the Government and their employer as "double dipping", yet will still happily claim living away from home allowance while staying in their wives' houses in Canberra. Do as I say, not as I do. That is the Coalition way. 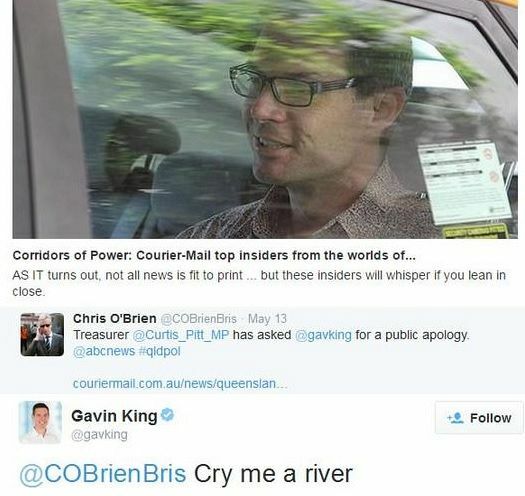 But when it comes to sheer mindbending hypocrisy, former Queensland LNP Newman Government Assistant Tourism Minister Gavin King almost certainly takes the prize. You might know of Gavin King as the main accuser of new Queensland MP Billy Gordon over scurrilous unsubstantiated allegations of domestic violence — ones, I have been reliably informed, which were this week dismissed by Queensland Police. Looking at the waitress as she tried to explain where our food was, I started to wonder what my fork would look like lodged firmly in her right eyeball. If a woman drinks to excess during a night out on the town, is she partly to blame for being raped or assaulted? As uncomfortable and difficult as this question is, the answer surely is yes. Shortly after that, King was pre-selected by the LNP for the seat of Cairns. Their sort of man, apparently. Cairns MP Gavin King was accused of parking his electorate car in a disabled bay on a social media site. The King has not taken lightly to the criticism, insisting the park wasn’t properly marked and was actually a loading bay. He’s called in lawyers, demanded an apology and chastised people for not thinking before they publishing [sic] material. “For too long, people have been allowed to get away with saying whatever they want on social media because they think there are no consequences,’’ the King thundered. The fact that it actually was a disabled parking spot, as clearly shown by the following image, was apparently irrelevant to King. King even demanded the Council repaint its disabled parking spaces more clearly and threatened legal action against media outlets who ran the story about him parking in a disabled space. So, it should come as no surprise to anyone to find Gavin King putting a story on his smear website alleging new Queensland Treasurer Curtis Pitt had parked in a disabled car parking spot. Poor Gavin has confused ‘irony’ with hypocrisy — because that was not Curtis Pitt’s car. It was his mother’s. As it turns out, Treasurer Pitt was in Brisbane on Tuesday, preparing to respond to the Federal Budget, so he couldn't have parked in a disabled spot in Cairns as Gavin King has alleged on his blog. According to Pitt’s office, the car is actually registered to Curtis’s 64-year-old mother Linda Pitt, who suffers rheumatoid arthritis and is currently recovering from a broken foot. The photo was, it seems, taken when she was visiting the chiropractor at Cairns Central on 12 May 2015. According to Pitt’s staffers, Linda’s car’s registration plates and her disability permit number are registered with centre management at Cairns Central. She had displayed her disability permit using a suction cap to attach it to her windscreen, but unfortunately it had fallen off. I had to ring my mum and explain to her what a blog was and why had a man had taken a photo of her car and put it on the internet. She was very concerned. Gavin’s always had poor attention to detail he should try to get his facts straight if his blog is to have any credibility. I had hoped his behaviour would change after politics, apparently I was hoping for too much. Of course, Gavin King was told about this in not uncertain terms, but “with a delicious sense of irony” the story and the tweet still remain displayed on his website and Twitter account. In fact, King couldn’t give a damn, because apparently the issue wasn't about Pitt allegedly parking in a disabled spot at all, but rather it was all about infrastructure and debt. But, of course, that is the conservative way. Once they are found in in a lie, deflect and – as bold as brass – “with a delicious sense of irony”, "cry me a river" – move onto something else. Never apologise, never admit a mistake, never look back. Far from being apologetic about this utter fraud, King has been boasting about a “spike” in website traffic to – wait for it – 88 hits. The King story shows how you need to distrust anything you are told by a conservative politician or journalist. They will happily lie to you and, presumably, justify it to themselves as being “for the greater good”. You see, they see themselves as born to rule and the only ones who can. And you think you are serving “the greater good”, a little hypocrisy and a few white lies is totally justified, is it not? We need to demand politicians ‒ of all persuasions ‒ to tell us the truth. And nothing but the truth. And when they tell us lies and then deny it, we need to tell them, in no certain terms, that this is unacceptable. And I say that without any sense of irony — delicious or otherwise. Support truthtelling journalism. Subscribe to IA for just $5.